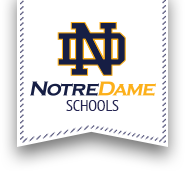 Notre Dame is consistently looking for qualified candidates to join our dedicated faculty and staff. Our rigorous learning environment fosters the individual talents of all our students, and that starts with our faculty and staff. For an opportunity to pursue academic excellence and mold tomorrow’s future leaders, please email resumes to Ron Spadafora at rspadafora@syrdiocese.org. Our food service workers are responsible for the preparation and service of quality food to students in a quick, safe, and pleasant manner. They must be fast-paced, energetic on a daily basis, and have a positive attitude when serving meals to scholars. Above all, we look for individuals who are passionate and committed to education. Cooking experience preferred but will train. To apply: please email resumes to Ron Spadafora at rspadafora@syrdiocese.org.